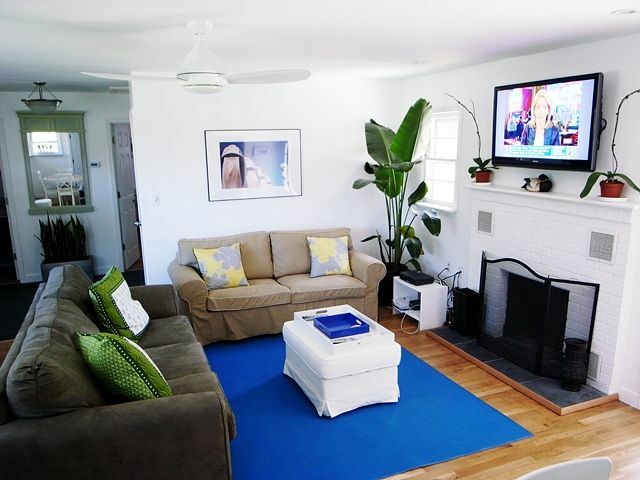 A great place for a short or long-term vacation, this beautiful, newly renovated 2 bedroom, 2 bath ranch home is located in a quiet neighborhood just blocks from the beach and a short 5-minute drive/ or 2-mile bike ride to Sag Harbor Village. The home features an open floor plan, hardwood flooring, fireplace, air conditioning, flat screen TVs, and a fully equipped kitchen with stainless steel appliances. Stroll through French doors to enjoy barbecues on the patio (gas grill provided) and relax in the large private yard. With a sofa bed in the living room and a futon in the den, this home can sleep up to 8 guests and entertain several more. A perfect summer retreat in an ideal location. Requests for weekend-only rentals during the summer are considered based on availability. Bathroom #2 has a shower with a convenient hand-held showerhead. Bath towels provided, please bring beach towels. There are also 2 barstools for eating at the island counter. This house features a bright, open floor plan with plenty of natural light. Along with the fully-equipped kitchen, we provide all the cooking utensils, pots & pans, dinnerware, flatware and glassware. All you need to do is bring the food. The kitchen island comes with 2 bar stools for extra seating. There are two (2) flat-screen tv's with cable, a dvd player and wireless internet access throughout the house. Most lights have a dimming option to create the perfect atmosphere for you and your guests. The driveway has parking for up to 4 cars, while the large capacity washer and dryer are located in the basement as well as extra storage space. A true gem in Sag Harbor! I rented this house around February and March for a planned girls' weekend in July and it was the perfect escape! The photos online were great, but everything was even better in person! My friends and I cooked one night, and the next night we took a quick uber ride into town. Popular beaches were about 20 minutes away, but the cove was a pleasant walk from the house. The home was cozy and inviting and had everything we needed. I would highly recommend this home to anyone considering a weekend away. We enjoyed this cozy cottage for our recent getaway. The neighborhood is very quiet. It is easy to get to Sag Harbor, Bridgehampton, and Southhampton without traffic.We walked to Long Beach for sunsets. The kitchen was very well stocked. There was plenty of seating indoors and outdoors . We utilized the gas grill several times . Thank you for creating a lovely place to visit. The back yard and the perfect kitchen made for a very, very relaxed stay. And the photographs in the house were just beautiful. It was great! We really loved the house and the location; nice to be able to walk to the beach and a short drive from Sag Harbor town so we could grab a nice coffee in the morning. We were a big group and still managed to fit comfortably. Kids loved hanging out in the basement. The kitchen was well-stocked and we did a decent amount of cooking at home, enjoying delicious ingredients from the nearby farm stand. We were missing sheets for the fold out couch, but Ruby had the housekeeper come provide them the next day and gave us a discount for the trouble. Overall a great experience and we would stay there again for sure. Great little cottage in Sag Harbor area. Great little cottage. Comfortable beds and linens. Only complaint would be to have a bar of soap in each of showers. Clean cottage with great kitchen supplies. Convenient bike ride to town of Sag Harbor. Nice patio and loved that beach was so close. **Note: Our rates are negotiable** Requests for weekend-only rentals during the summer are considered based on availability.